Barrie Colts trade Matt Brassard to Oshawa Generals for picks. #OHL - Very Barrie Colts | A website covering the Barrie Colts of the OHL. The Barrie Colts have traded Matt Brassard to the Oshawa Generals for draft picks. Colts acquire a 2nd round pick (Kingston's) in 2017, a 3rd (Sarnia's) in 2018 and a conditional 3rd (Oshawa's) in 2020. Last season he appeared in 28 games with Barrie. He put up 1G;3A. He totaled 13 penalty minutes and ended the season a +10. Brassard has really stepped up this season and has been a huge part of a struggling team. With guys like former Captain Michael Webster gone to OA and Rasmus Andersson moving on, the team has struggled to really do much. Brassard has moved from a bottom six guy to a force on the blue line. This season, over 29 games (1 more than he appeared in last season) he has already put up 5G;9A, almost quadrupling his production in about the same amount of games last season. The Barrie native has done a great job of getting pucks towards the goal. His 105 shots on goal this season is the most of all players on the Barrie Colts and second most for defencemen in the OHL. Last season over 28 games he only got 12 shots on goal. 3 of his 5 goals have come on the power play (3rd most on Colts) and 6 power play assists (4th most on team). 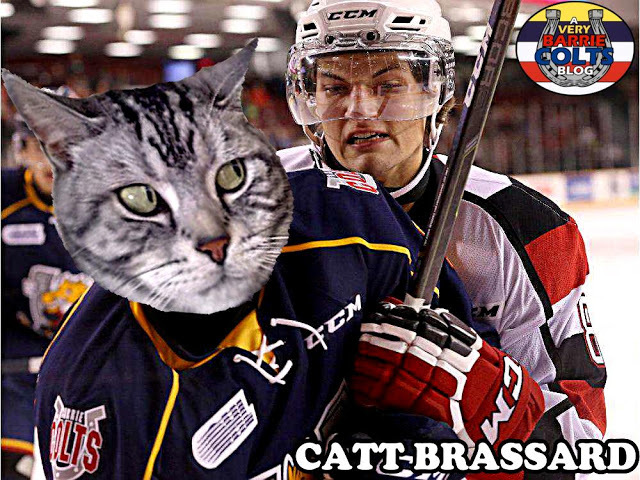 We would like to wish Brassard the best of luck in Oshawa! If you get a chance Matt, try out Hollywood Cone downtown! Colts acquire a 2nd round pick (Kingston's) in 2017, a 3rd (Sarnia's) in 2018 and a 3rd (Oshawa's) in 2020.